Next Meeting: Wednesday, April 10, 2019, 6:30 p.m. – 8:30 p.m. In our April meeting, we will delve into a novel method for adding imagery and visual appeal to books – stitchery! Sally Blanchard-O’Brien will lead us in an exciting exploration of the many different ways that stitching can be used as a structural element in bookmaking, as well as a decorative design element. The meeting will introduce us to a wide variety of ideas, with time to try a few different techniques. We’ll also have some time to share, so please bring any books you’ve made that feature stitchery as a decorative element. The stitching can be ornamental (e.g., on the pages or covers as decoration) or structural (e.g., Keith Smith’s centipede binding or fancy Japanese stab bindings). We thought we had dodged the snow, until we opened the door after the meeting – surprise! Hope everyone got home safely. Our March meeting, Mark-Making, was another episode in Imagery for Books, our multi-month focus. Marilyn Gillis shared her story of how mark-making became a central part of her work. While explaining many different techniques and materials for making your own marks, she shared many beautiful pieces she has created using them. For the hands-on portion of the meeting, Marilyn set up different stations with her favorite techniques and let us all try them out. Clearly, fun was had by all! There was lots of collaboration and experimenting going on with straws, pipe cleaners, and wax, just to name a few. A big thanks to Marilyn for an exciting evening, and thanks to everyone for coming and participating! Our annual book arts show will be hosted by the S.P.A.C.E. Gallery in Burlington, VT. We are excited to be in a wonderful space in Burlington from June 7 – 29! The title for the show is Bound to Happen, and it’s open to any interpretation from the artists. Entry due date: May 31, 2019 No Entries will be accepted after this date. Artists are encouraged to bring work and appropriate paperwork to the May 8th BAG meeting. Opening reception: June 7, 2019, 5:00 p.m. – 9:00 p.m. The reception coincides with First Friday, a popular event in the South End. Artist’s Talk: Work will be returned to the artist at the July 10th B.A.G. meeting, at which time we will share our work. Entry paperwork can be downloaded here. Entry fee will be $10.00 for up to 3 pieces. Work must be ready to hang or display. If you have display instructions, please include them with your entry. Work must have identification somewhere on the piece. The gallery commission is 40%, so please price accordingly. Have questions? Please ask Marcia. With the end of our multi-month presentations about imagery, let’s close with a collaborative project to celebrate. We invite you to create 6 postcards to swap, and 1 to keep for yourself. They can all be the same or all different, as long as they are 4″ x 6″. Some ideas might be to pick a theme like shoes, birds, or a quote, and play around with ways of adding the imagery. Any medium can be used – take inspiration from the huge amount of techniques we have learned! At the July meeting, we will exchange postcards with 6 others. With these original artworks, participants will create a book structure to hold the cards, and share their creation at the September meeting. Plenty of time to complete the challenge! April meeting: Introduction to the Postcard Exchange project. Presentation of examples of structures to house postcards, so you can get thinking. July meeting: Participants bring 6 original postcards, 4″x6″, in any medium to swap. Participants leave with 6 different postcards to collect in a book structure. September meeting: Participants present their book structures, and we are amazed. *** Show us what you’re working on! As we continue with meetings that teach us more about image making the idea of sharing what we’ve learned has emerged. At each meeting we learn some skill and then go away and often explore that skill on our own. No one gets to see this private work. Now we would like to invite participants to share their explorations into collage and mark making and stitching and whatever else strikes your fancy. We encourage everyone to bring in something you’ve been working on/experimenting with to share with others. This is to be a very informal activity and outside the agenda of the meeting since it is so hard to accomplish everything in the two hours as it is. Works can just be put out in a designated place to provide an opportunity for informal conversation. The room is available to us beginning at 6:00 p.m. so between 6:00 p.m. and 6:30 p.m., we can use the space for free time or for sharing. *** Penne Tompkins has work featured in The Art of Calligraphy, exhibit open through May 29th at the Gallery at the VAULT in Springfield, VT. The exhibit includes an amazing display of artwork created by five of Vermont’s finest calligraphers. This is an opportunity to be inspired by their wonderfully diverse styles, each reflecting the artist’s love of words enhanced by their own unique art forms. The gallery is open on Mondays from 11:30 a.m. – 2:30 p.m. and Wednesday – Saturday from 11:00 a.m. – 5:00 p.m. For more information please email galleryvault@vermontel.net or call (802) 885-7111. *** The international art magazine, Ceramics Art + Perception, issue #111 has published an interview on B.A.G. member Nina Gaby’s 3-dimensional memoir work in mixed-media: Ways to Tell a Story. Congrats to Nina for the wonderful feature! Be sure to check out the article online. *** Calling all poets and writers of all ages and experience and those who love combining words and art! B.A.G. member and The Poartry Project founder, JC Wayne, is launching a new bi-monthly art-inspired inclusive community poetry reading series. Each reading centers on each new art exhibit at Flynndog Gallery at Burlington’s South End Station. Poets and writers are invited to visit the exhibit and write and submit a 1-page original poem or prose piece inspired by the art on display. The first reading of work inspired by the paintings of Roger Coleman and the photography of Peter Curtis is Saturday, April 27th, 2:00 p.m. – 3:00 p.m. with food and drink available for purchase from Nomad Coffee before and during the reading. Please visit the Poartry website for important writing process details/submission guidelines. The submission deadline is April 11, 2019. If you have questions, please contact JC. For those interested in participating but may need more time, deadline extensions are available. Please encourage kids in your life of all ages to participate! *** Elissa Campbell is teaching the Phabulous Photo Album at the Bayside Activity Center in Colchester, VT on April 18th from 5:30 p.m. – 8:30 p.m.
Each participant will leave class with a completed photo album and a basic knowledge of bookbinding technique. You will receive a detailed handout and resource list for all materials we use. No previous experience required – this is a great class for a beginner. You can even bring in your own cover materials to customize your book. All tools and materials will be provided. Registration is available online. You can also download a pdf of the registration form and mail it in with your payment. *** The University of Southern Maine‘s 7th annual Book Arts Bazaar will be held on Sunday, April 7th from 10:00 a.m. – 3:00 p.m. at the Wishcamper Center on the school’s Portland campus. This festival with book artists, papermakers, bookbinders, printmakers, educators, and writers is dedicated to all things related to the book. The free event is sponsored by USM’s Kate Cheney Chappell ’83 Center for Book Arts. Carolyn Shattuck will have an exhibitor table with her artists books, so be sure to stop by and say hi! The event is free and open to the public. For more information, please contact Rebecca Goodale. *** On April 12th, the Book Arts Workshop at Dartmouth College is hosting the Stephen Harvard Memorial Lecture and Symposium, Touch Your Words: Teaching Indigenous Languages Through Making. The recent purchase of metal type in the Cherokee Syllabary has prompted new interest in the Book Arts Workshop at Dartmouth College Library. With the Cherokee type and other printing and binding activity, faculty in Native American Studies, Anthropology, Linguistics, and Environmental Studies have integrated book-making projects into their courses, giving students hands-on exposure and practice in the study of indigenous languages. Over the past year, a number of students and faculty have engaged in applied learning in language revitalization with the Book Arts Workshop. The lecture and symposium seek to bring together makers of all kinds (students, scholars, librarians, writers, artists, and printers) to exchange their experiences and knowledge in tactile learning and explore new possibilities. Dartmouth is located in Hanover, NH. For more information, please visit the Dartmouth Library website. 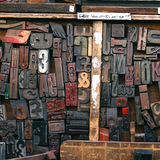 *** The Museum of Printing is having a letterpress sale on April 13th from 10:00 a.m. – 4:00 p.m. The Museum is dedicated to preserving the rich history of the graphic arts, printing and typesetting technology, and printing craftsmanship. Tabletop and floor presses, type, type cabinets, borders and ornaments, furniture and reglet cabinets, and all sorts of good letterpress stuff will be available. The Museum of Printing is located at 15 Thornton Avenue in Haverill, MA. *** Amos Paul Kennedy, Jr. will be in residence on the Wells College campus conducting a week-long series of events co-sponsored by The Wells Book Arts Center, Office of Diversity and Inclusion, the String Room Gallery and the Wells College Scholar-In-Residence program. Visual Noise features poster prints by acclaimed letterpress printer and book artist Amos Paul Kennedy, Jr. Renowned for his bold use of typography and renegade letterpress technique, Kennedy has built a forceful, witty, and subversive creative practice centered on calling attention to past and present experiences of race, labor, art, and printing. While his work is widely exhibited and held in collections, he ensures access to his posters by selling them at affordable prices. Visual Noise will culminate with a Cash & Carry event, with all posters available for purchase. Wells College is in Aurora, NY. *** The New England Guild of Book Workers is presenting a lecture with Bay Area based bookbinder John DeMerritt at the North Bennet Street School on April 18 from 6:00 p.m. – 8:00 p.m. – Building a Living Craft. John will give a talk based on the editions of books, boxes and housings he creates for artists, galleries, fine art publishers and institutions. He will discuss how he has developed his studio practice and his origins as an Edition Binder. Much of John’s recent commissioned work has been to create housings for digital media Art Projects. This has propelled him into new areas of edition binding that require him to embrace new technologies and expand the traditional role of the binder in terms of ‘book’ work. Using these new projects as a platform, John will discuss how working with new media and formats has simultaneously transformed his studio practice and reinforced its traditional origins. The lecture is free and open to the public. No RSVP is required. The North Bennet Street School is in Boston, MA. *** On June 8 & 9, the North Bennet Street School is offering Bookbinding 101 with Amy Lapidow. In this class, students will get a quick introduction to various bookbinding techniques by exploring three different book structures. The class begins with a simple pamphlet and continues with constructing two multi-signature books known as a flatback case binding and link stitch binding. Finally, students construct a box to house all of their creations. This class is a great way to familiarize yourself with bookbinding and is perfect for those who are curious about the craft. All tools and supplies are provided for this class. For more information or to register, please visit the NBSS website. *** On Sunday, June 9th, The Eliot School in Jamaica Plain, MA is offering Celebration Accordion Books with Susan Porter. Using an accordion book form, make a festive book full of surprises, packing it full of words, letters, tiny booklets, pockets, windows, beads and a range of other materials to give meaning to your celebratory wishes. Develop a concept, decide on your palette, chose a theme or occasion, then dive into a wealth of ingredients to build your book. Leave with a dramatic one-of-a-kind gift, or meaningful object to keep yourself. For more information about the class, please visit the Eliot School’s website or click here to download the complete catalog.